How to Transfer/Copy Digital Copy movie to Surface RT? Got an error message when you tried to copy a Digital Copy movie to your Surface RT? Here you will find an effective way to achieve your goal smoothly. The Microsoft Surface RT is incredibly flexible in terms of media you can put on the device and users have a whole slew of problems when it comes to watching videos on Surface RT. If you've transferred some Digital Copy movies to your PC, you may want to get them ported over to your Surface RT for playback. However, when you tried to open them with xbox video they would not open and continued to give error messages says "can't play". So what if any Digital Copies work on Microsoft Surface RT? Basically, film makers use DRM (Digital Right Managemet) to protect their copy-right. This prevent you from watching the movies with an unauthorized media player or portable device. It is a pleasure that the Windows Media Player is one of the authorized media players. However, Microsoft didn't include Windows Media Player or Windows Media Center in Windows RT. This means Digital Copy movies will not even play on Microsoft Surface RT. Note: Before conversion you need first to transfer Digital Copy to computer in Windows Media (.wmv) or iTunes video format (.m4v). If you have no idea about how, check my earlier post "Blu-ray/DVD Digital Copy: Transfer, Play and Backup" to learn details. Step 2: Click "Add" button to import your Digital Copy movies or just drag and drop the movies to the software. Batch conversion is supported so that you can add multiple files to convert at a time. Step 3: Click "Format" bar and move mouse to "Windows" column, you can easily find the profile of "Microsoft Surface Windows RT H.264 Video (*.mp4)". The output videos could fit on Surface RT tablet perfectly. If you like, you can click "Settings" to change the video encoder, resolution, frame rate, etc. as you wish. Step 4: Click the big "Convert" button to begin encoding your Digital Copy to Surface RT playable videos. Once the encoding task completes, you can transfer the result videos to your SD card for your Surface. 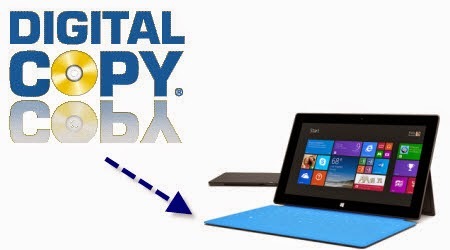 There now you know how to get Digital Copy movies onto your Microsoft Surface RT tablet so you can watch them on that gorgeous screen! This workaround works with Windows 8, Windows 8.1 as well, of course. 1. 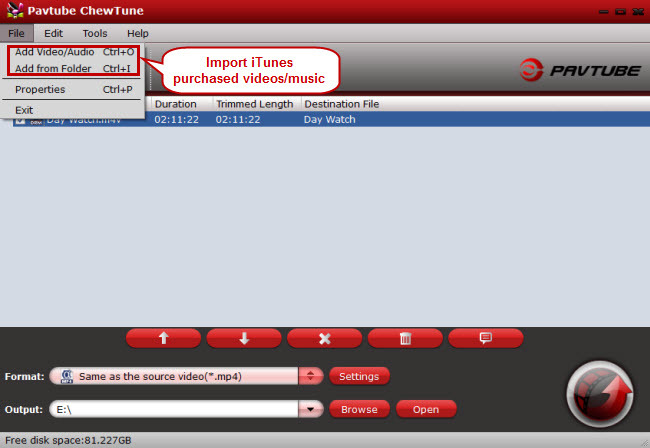 About ChewTune - An easy-to-use yet intuitive and stable DRM converter which can help you strip DRM protection from iTunes, Blu-ray/DVD Digital Copy movies Amazon, Zune, BBC iPlayer, Napster, Blockbuster, etc. and convert videos to all popular video formats like MP4, MOV, MKV, WMV, AVI, FLV, etc. for playing and sharing anywhere you like. The audio/video synchronization is very good and the quality of the converted videos too. It's completely free for protected Audio files. 2. Check out "The Ways Transferring Files to Your Surface" if you have no idea about Surface RT file transfer.